Written by a team of business and technology expert practitioners—who also authored Code Halos: How the Digital Lives of People, Things, and Organizations are Changing the Rules of Business—this book provides a clear path to the future of your work. The first part of the book examines the once in a generation upheaval most every organization will soon face as systems of intelligence go mainstream. The authors argue that contrary to the doom and gloom that surrounds much of IT and business at the moment, we are in fact on the cusp of the biggest wave of opportunity creation since the Industrial Revolution. Next, the authors detail a clear-cut business model to help leaders take part in this coming boom; the AHEAD model outlines five strategic initiatives—Automate, Halos, Enhance, Abundance, and Discovery—that are central to competing in the next phase of global business by driving new levels of efficiency, customer intimacy and innovation. Understand the untold full extent of technology's impact on the way we work and live. The digital world is already transforming how we work, live, and shop, how we are governed and entertained, and how we manage our money, health, security, and relationships. Don't let your business—or your career—get left behind. 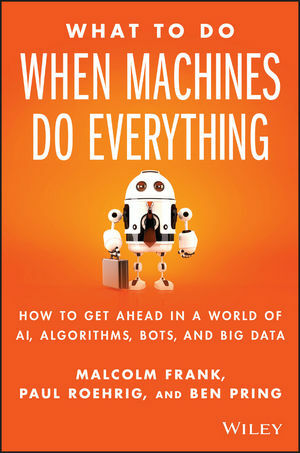 What To Do When Machines Do Everything is your strategic roadmap to a future full of possibility and success. Or peril. BEN PRING leads Cognizant's Center for the Future of Work, which helps clients bring the future of work to lifetoday.